View 10 acres of Iris in bloom, flanked by colorful perennials on all sides. Walk the gardens, have a taste of wine or craft spirit, munch on a picnic, bring home a bouquet of iris. Entrance fee $5 per car. 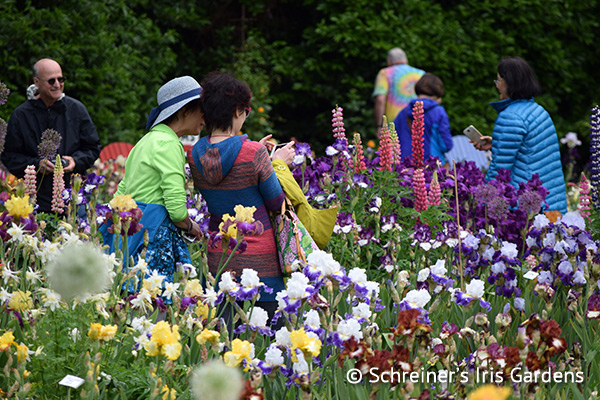 Friday-Sunday: Iris Bloom Season open house kicks off. Open daily, rain or shine, 9:00 a.m. to 6:00 p.m.; Gift shop open daily 10:00 a.m. to 6:00 p.m. Noon to 5:00 p.m. Wine tasting with Anne Amie Vineyards featuring their 20th anniversary blends. Benefit Garden tour begins at 11:00 a.m. $25/person. 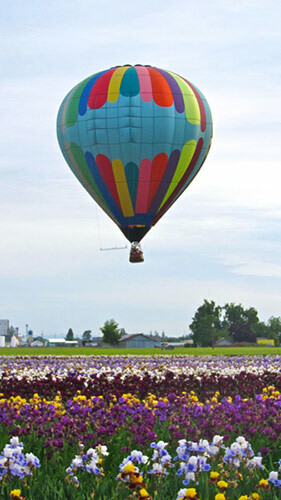 Pre-registration required (contact event organizer via email (sielicky@aol.com) or phone (503-949-2890). Proceeds of this event will benefit the Division of Pediatric Cardiology at Doernbecher Children's Hospital and the Menashe Fund researching adult congenital heart disease at OHSU. Sunday, May 12: Happy Mother's Day! Bring mom, bring the family. Enjoy 1/2 off your first dozen fresh-cut iris stems. Enjoy a stroll among the iris. Some wonderful memories are to be made, and great photos too!